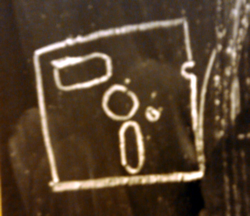 floppy disk in chalk by a stranger at the happy village in chicago. thanks stranger! Here are 7 possible causes for the symptom hearing loss. An ear disorder that invokes irritation and swelling of the inner ear. An ear disorder that invokes irritation and swelling of body parts other than the inner ear. A social condition that evokes irritation and swelling of the inner ear. Foreign objects can enter the human body by swallowing, insertion, traumatic force, inhalation, hypnotism, dreams, wayward thoughts, wayward glances, piercing stares, evil eyes, eagle eyes or thoughts about eagles. A /ruptured eardrum is an opening in the tympanic membrane (eardrum), through which a torrent of inter-dependent basslines and languages flood, occupying the breadth of the audible spectrum and putting the patient into a trance. Acoustic trauma is injury to the hearing mechanisms in the inner ear due to very loud noise, such as a clap of thunder, a handclap, a snare drum, a kick drum or a hi-hat. A head injury is any trauma that leads to injury of the scalp, skull, or brain. Walk it off. Comments have been disabled for posts older than 1 month. sing sweet software is a fortnightly podcast for funky computers.